Comet 67P/Churyumov-Gerasimenko as seen from the Rosetta probe on Nov. 2, 2014. European scientists and engineers are gearing up to soft-land a robotic probe on the mysterious surface of a comet for the first time. The European Space Agency's Rosetta spacecraft is just days away from releasing its Philae lander down to the surface of Comet 67P/Churyumov-Gerasimenko, and scientists working with the mission can feel the anticipation building for the Nov. 12 landing. If successful, the Philae landing will be the first time humans have ever soft-landed a probe on a comet's surface. The small Philae lander — named for an obelisk found on an island in the Nile River in Egypt — is designed to study the surface of the comet. Meanwhile, the Rosetta probe will study Comet 67P/C-G from orbit. It took 10 years for the probes to catch up with the comet, and landing on the "dirty snowball's" surface will be no easy task. A number of steps and specific commands must be executed in order to ensure that Rosetta doesn't crash into the comet and that Philae arrives at its landing site safely. Rosetta should release Philae when the two spacecraft are flying about 14 miles (22.5 kilometers) from the center of Comet 67P/C-G. European Space Agency officials will have to wait for 7 to 10 hours before finding out if the landing was successful. 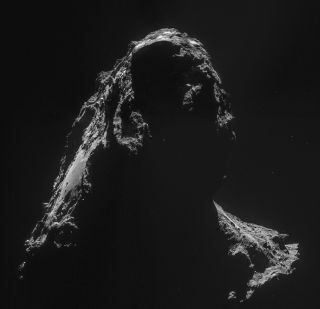 "The surface of this comet is very, very rough," Andrea Accomazzo, ESA Rosetta flight director, said during the webcast. "It's not the ideal place to land on, but this is what we have, and this is what we're trying to do. We have to be a bit lucky, as well. If the lander hits the surface of the comet in the proximity of a boulder or something like this, then there's nothing we can do. We cannot actively steer the trajectory of the lander on descent. That's the part that worries me most." That said, Accomazzo added, the teams on the ground feel fully prepared to accomplish the difficult task of landing Philae on the comet. Once Philae gets to the surface, the lander will deploy a harpoon into the comet, which should tether the probe to the dusty cosmic body. Rosetta is expected to stay with Comet 67P/C-G as it makes its closest approach with the sun in August 2015. The two spacecraft will beam back scientific data to Earth that could help scientists understand more about comets and the early solar system (when the balls of ice and dust first formed), among other things. Instruments on Rosetta have already revealed that the comet smells a bit like rotten eggs. Rosetta launched to space in 2004 on a 4-billion-mile (6.4 billion km) journey to the comet. The spacecraft arrived at Comet 67P/C-G in August.